Do you know where to get the best Gozleme in Perth? H tasted that flat Gozleme... 'and never again would I want to eat that piece of crap again...', H lamented. 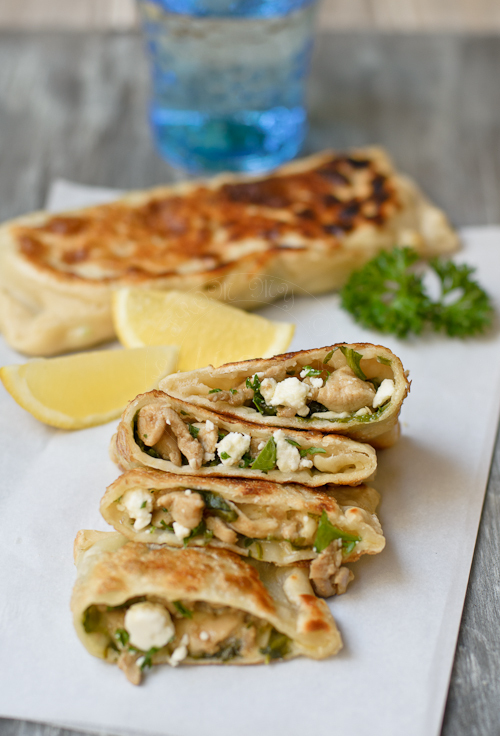 This is my version of Gozleme...superb for BBQ get together. Heat up the saute pan with 1 tablespoon of vegetable oil. Add chicken and stir and simmer until the chicken is cooked and liquid evaporate. In another bowl, mix spinach, feta and mint. Carefully and gently fold the dough and crimp the edges. Place and cook the gozleme until it turn golden in colour. Scrumptious! A wonderful speciality. Lovely filling. So tasty. What a delicious looking dish! Perfect snack or even light meal! Absolutely stunning recipe and photos. I can see how you make this Turkish pastry more authentic and delicious than ones you find in shops. Btw, stumbled upon your lovely blog... Cool!